The Leaders of the other Worlds in the Wizard101 Spiral. 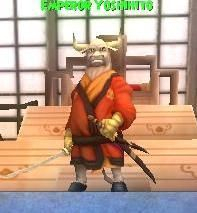 He is the emperor and ruler of Mooshu. When he refused to hand over the key to Dragonspyre to Malistaire, he was poisoned which allowed the Jade Oni to take over. He was also a member of the Council of Light. Emperor Yoshihito relates to the 123rd Emperor of Japan, Emperor Yoshihito. 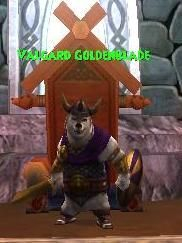 Valgard Goldenblade is the King of Grizzleheim. 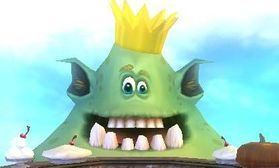 He's the private sort that we only get to see him once we prove ourselves in the battle and restore order to Grizzleheim. King Thermidor had the desire to be a Rock and Roll star even though he was only a crab. While on his journey to discover stardom, Amedeo took over his spot and pretended to be the King of Crab Alley. After we fight the false King out of the throne, we find the true King in the Wailing Caverns and convince him to come back and reclaim his throne. The Gobbler King is a huge Gobbler that likes to eat castles. We only get to speak to him when we defeat his son, Prince Gobblestone. He's not that terribly bright, but we were able to convince him to stay in Colossus Boulevard and not enter the other areas of Wizard City. If he didn't listen, our whole world would be in peril due to his large stomach. King Artorius is an reference to King Arthur of Camelot. King Arthur's last name was Pendragon. He got poisoned by Morganthe who is similar to the Morgan Le Fey character. We were able to find a cure for King Artorius after travelling all over Avalon which is also an reference for Camelot. After defeating him, we administer the cure and King Artorius was able to shed his Pendragon transformation. With our help, he was able to rule Avalon and put it back in order. 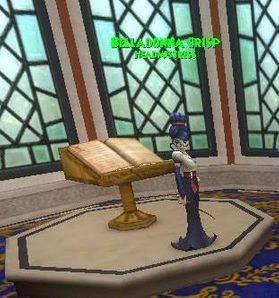 Belladonna Crisp is the Headmaster of the Pigswick Academy school. She looks suspiciously similar to Morganthe, but we cannot find any links between them. But we wonder, are they related? Belladonna believed that her students were better than the Ravenwood students. But fortunately, we prove her wrong. 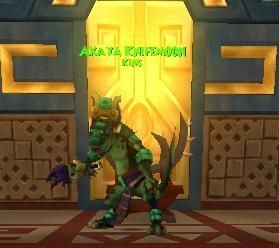 Vladimir, or Dean as we better know him as, likes to lurk in the one of the main building of the Labyrinth in Wizard101. He pretended that he was on our side, but in the end he showed his true colors. We defeated him to get our portal stone to the transporter that would let us go to Dragonspyre Academy. She is the spiritual leader of Grizzleheim. She is the oldest creature in the Spiral. She, also known as Lady Nightstar, was the one who gave Bartleby his very special eyes. Because of the cruel titans and the Raven Coven, we had to free her from an imprisoned ice cage. Once freed, Grandmother Raven was able to blend into a tree and be free to be a part of Grizzleheim when before she couldn't do so. Hades is an reference to the Greek God, Hades. The name, Hades, means "God of Death and Riches." He permanently dwells in the deep Tartarus where we first meet and fight him. We also get to meet his personal pet, Cerberus, who is a three headed dog. Cerberus guards the door to his personal residence. Like his brothers, he has a Vulture's head and a human male body. We get to fight him in the very final battle in Tartarus. Zeus is an reference of the Greek God, Zeus. The name Zeus means "The Father of Gods and Men." Zeus is related to Poseidon and Hades, they are brothers. He has an Eagle head and a human male body. We fight him in Aquila twice. First on top of Mount Olympus where he resides, then deep in Tartarus. He carries a lightning wand which he likes to shock us with. Poseidon is an reference of the Greek God, Poseidon. Poseidon is related to Zeus and Hades, they are brothers. Poseidon is the God of Earthquakes, Horses, Storms and the Sea. 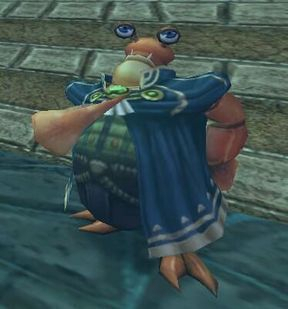 We get to confront him in Atlantea and Tartarus. He's quite enough to beat. Like Zeus, he has a bird head and a human male body. He carries a Trident. He normally resides underwater. Ymir is the Ice Giant of Wintertusk. His own sons were commanded by the Raven Coven to stop us, so they could bring the Great Everwinter to the entire world. We get to meet Ymir when we fight his four sons in the final battle of Nastrond, Wintertusk.